2016 is a year of firsts for Fergus Maximus. Our first music video is now live and we’d love for you to see it. 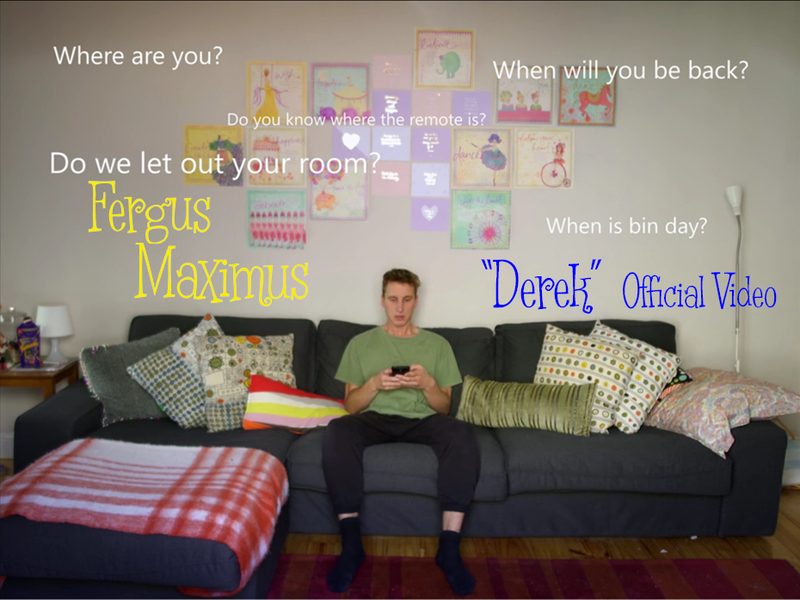 “Derek” was the lead single from the debut Fergus Maximus EP “Songs & Stories” (2015). The video was directed by John Chataway and stars the wonderful Lachlan Scown as Derek’s Housemate (alongside Gypsy the Cat as Mr Mittens). The project was part of the Vision and Sound initiative set up by Music SA and the Department of Screen and Media at Flinders University. Click the link below to check it out on the hhhhappy blog and Like it if you like it. And if you’re willing to share it from the hhhhappy blog (and encourage others to do the same) that would be all kinds of awesome — the more shares it gets, the greater the Like-lihood they’ll do a proper review which will really help get the word out. Speaking of which, please share freely and let’s get Derek out into the wild. As it were. Shot on location in Adelaide at Julia Kaminski, Rebekah Kraft and Selena Gillard’s place. Thanks for letting us mess it up. And thanks to Nathan Roberts and Liz Phillips for consenting to allow Gypsy the Cat to appear (as if Gypsy pays any attention to anything you say). No Dereks were harmed during the making of this film. 2016 will be an absolute ripper! Fergus Maximus was selected as one of the bands for the new Vision and Sound initiative organised by Music SA and Flinders University. In a hugely exciting development, third year students from the Bachelor of Creative Arts in Screen Production are collaborating with local bands to produce music video clips. Ferg met with his director, John, to discuss the overall shape of the clip and it is going to be all kinds of cool. Seriously. In other news, Ferg has been listening to the mixes for the next Fergus Maximus release (and they sound GREAT! Huge thanks to Matt Williams at Fat Trax Studios). This is a live Fergus Maximus set recorded at The Gaslight Tavern in August 2015, with Ferg on vocals, sax and percussion, Kym on guitars (and stomp box) and Jamie on basses. Some of you were probably there! A couple more minor tweaks and the tracks will be ready for mastering. Which means, of course, there must be a launch party coming! The ‘One Gaslit Night’ EP will be launched at The Jade on Sunday, 17 July at 5 pm, supported by the wonderful Courtney Robb. The launch will be part of the Umbrella Winter City Sounds Festival and will also be linked in with the Guitars in Bars initiative organised by the Adelaide Guitar Festival. Once ticketing information is available, we will let you know. Don’t miss this one, folks. It is going to be our best show yet! And speaking of festivals, rumours are that Ferg will have some super exciting news to share on that front really soon! So excited to tell you about that but for now, our lips are sealed.